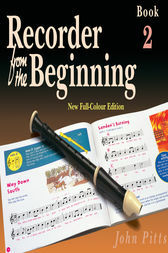 This recorder course by John Pitts is written for 7-11 year olds no previous knowledge of music or recorders is necessary. It is carefully graded with clear explanations at every stage, enouraging children to develop musical skills as well as recorder techniques. The teacher's books include simple piano accompaniments, guitar chord symbols and performance suggestions for classroom percussion. The tune books provide extra solo and duet material to supplement the instruction in each book ideal for children who need more practice and for fast learners who need extra material to hold their interest.